We'll be adding daily digests for comments as soon as we can. For now, you'll be able to either get your comment notifications immediately, or you can turn them off. Anyone can leave a comment by default, but we do run anti-spam software so that you don't get lots of annoying spam comments. The worst your real visitors will see when trying to comment will be a captcha, powered by Recaptcha, but we only do that if we think the comment looks like spam. 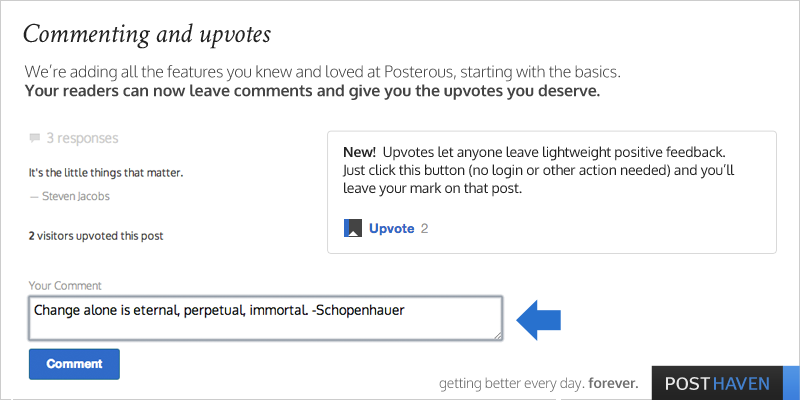 In addition to daily / weekly comment digests, over the coming days we'll be adding Facebook / Twitter login, the ability to close comments automatically if the posts are old, e.g. 90 days (which will be configurable), and comment-by-email (once post by email is ready). Thanks again for your support. We'll keep shipping these features as soon as we can. Give commenting a shot here! Aleksej Lebedev upvoted this post. Lets see whether it really works. Aleksej - Yup, thanks for giving it a shot. Hopefully the first of many! Y Combinator upvoted this post. Great to see PostHaven is alway improving ! Thanks. Kim Rampling upvoted this post. This is a cool. Love the upvote facility. Nice to have comments back - I don't get many, but the few I do get have always been nice! Nice! Now I no longer have to hear my husband tell me to tell you to fix that. Keep up the great work! Matthew Smith upvoted this post. LocalBizDev Guy upvoted this post. Bryan Hughes upvoted this post. Any timing on posts by email - that is send an email when a new post is available to a mailing list? Justin Woodbridge upvoted this post. Winton Ridabock upvoted this post. Gecko Landmarks upvoted this post. Manabu Tatsumi upvoted this post. James Randal Matheny upvoted this post. Brian J Wood upvoted this post. Jose Trigos upvoted this post. Niclas Pfeifer upvoted this post. Rabbi Dr Harvey Belovski upvoted this post. Arie Korporaal upvoted this post. Bethany Korp upvoted this post. MISSY MCLAMB upvoted this post. Jagan Ganti upvoted this post. Fantastic stuff. Now eagerly awaiting post by email. Matthew Supert upvoted this post. Emerson Povey upvoted this post. Thanks a lot for the update. But uhm, I'm wondering whether or not it'll be possible to comment/post anonymously with the future update. See, I'll be running two blogs from this account. One public and one anonymous. As it is now, this is possible. However, if it will become like the old posterous, it will only be possible by having two separate accounts. ("posted by "beruset"", for example) Same with the comments. Can't wait to see the new features!! Guillaume Aubert upvoted this post. Finally comments !! Many thanks. Would also love to see CSS customisation coming. Christian Zibreg upvoted this post. James Inman upvoted this post. Trvl John upvoted this post. David Pettersson upvoted this post. Listing Specialist - upvoted this post. Andrew Udell upvoted this post. Mark Edmondson upvoted this post. Very nice! I wonder how the spam protection work.